Editor's Note: This article is not meant to highlight autism as the only life-changing disorder to which you could minister. The advice and points given could easily apply to any family in your church or circle of friends, who has a special needs child. Imagine what it's like to see your child's development appear and then regress; then feeling baffled as you're trying to figure out why. Or imagine what it's like to be a child with sensory problems, screaming for the ceiling fan to be turned off because it sounds too loud. Picture yourself having a calendar filled with doctor and therapy appointments each week and rarely a moment to catch your breath. This is just a small window into what it's like to live with autism. Autism is a life-changing neurological disorder, altering every part of the day for the child and the families who love them. Exhaustion and confusion are regular parts of the everyday picture. Treatment decisions are weighed and prayed over on a continual basis. Even siblings have their own package of emotions as they grapple with the loss of normalcy in their family. It doesn't take being around a family very long to make your heart ache to know something, anything you can do to help. The good news is, there are six practical things you can do. Does their autistic son only wear his underwear around the house? If you're wondering why, ask the parents. Many issues that look like a picky, out-of-control child are, in fact, sensory issues. Parents welcome questions because it reveals interest and the willingness to learn. Read a book on autism, especially a book the family recommends—it will increase your understanding and compassion to minister. Watching a child with autism is different, but certainly not impossible. Start by coming to the child's home, just to visit with the parents and build a relationship with the him or her. After you've visited several times, try watching the child for thirty minutes or so. Have the cell number of the parents handy so you can call and ask any questions. This method will help you build confidence. Siblings will often be a big help, too, equipping you with insightful information about their brother or sister. There are people who are good at babysitting and others who are good at the everyday, practical tasks. Mothers often run behind on housework, due to the constant running. Fathers of kids with autism can be behind on home upkeep because they're watching the child in shifts with the mother or working extra hours to pay for special treatments. Consider anything you can do to help catch them up on basic chores, repairs, or other maintenance. 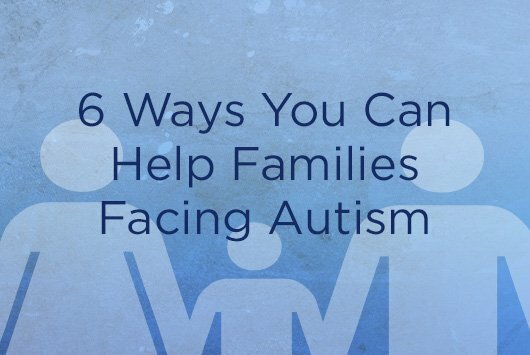 You can also consider blessing the family with a meal on one of the days their child does therapy. These things are a dose of grace and an incredible relief to the family. Let them talk about their emotions. Siblings often struggle with false guilt and need someone who can help sort things out, just by listening first. Is there an activity they want to be involved in? You can offer to step in and take them each week. Watch their brother or sister so they can spend time with dad and mom. Does this article remind you of someone in your life? Reach out today in some way, even if by a short message. Pray for future ministry opportunities to show the love of Christ. Sheila Gosney lives in Missouri with her husband and family. Sheila loves being a grandmother and thanks the Lord for such a blessing. During the week Sheila serves her local church as co-leader of a children's ministry. The older she gets, she realizes how much ministry is done spontaneously, through relationships with women who desperately need spiritual encouragement. Sheila is a freelance writer, a regular missions writer for the WMU of the Southern Baptist Convention, as well as a women's devotional writer for Journey magazine by Lifeway Christian Resources.